Orchestral collaborations have included the Boston Symphony Orchestra, Boston Pops, New World Symphony and Philharmonia of the Nations under the directions of Maestros Seiji Ozawa, Kurt Masur, Christoph von Dohnanyi, Sir Roger Norrington, Sir Colin Davis, Leonard Slatkin, James Conlon, Charles Dutoit, Rafael Fruhbeck de Burgos and many others. A Virtu Foundation scholar, Mr. Gjoni was a visiting cello faculty at The Boston Conservatory, where his master classes on the topic of Cello Physics were enthusiastically received by a sold out audience. He has been invited to teach at Cactus Pear Music Festival, Vianden International Music Festival, Luxembourg, Saarburg International Music Festival, Germany, University of Northern Colorado and the University of Arts in Tirana, Albania and has served as substitute teacher at the Juilliard School and New England Conservatory Preparatory Division. 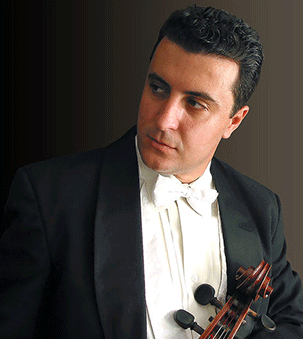 Mr. Gjoni joined the cello section of the San Antonio Symphony in September 2015 and is Adjunct Professor of cello at St. Mary’s University in San Antonio, Texas. Holgen Gjoni holds degrees from New England Conservatory, the Juilliard School, Boston Conservatory and Bucharest University of Music, having studied with cellists Paul Katz (former cellist of the Cleveland String Quartet), Bonnie Hampton (disciple of Pablo Casals and Zara Nelsova), Andrew Mark and Marin Cazacu. He was selected to play in masterclasses for Yo Yo Ma, Janos Starker, Natalia Gutman, Franz Helmerson, Radu Aldulescu and has extensively worked with chamber music experts such as Joel Smirnoff, Samuel Rhodes and Joel Krosnick of the Juilliard String Quartet, Martha Katz of the Cleveland String Quartet, Michael Tree of the Guarneri String Quartet, Norman Fisher and Mark Sokol of the Concord String Quartet and Pamela Frank, to name a few.